Dadaocheng is not a sanitized tourist district. It is living history. Shops are still owned and run by families that have lived in the area for generations. 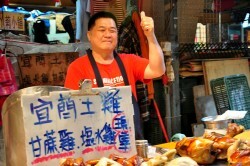 Famous street food stalls and restaurants have been honing their skill with the same recipes for decades. 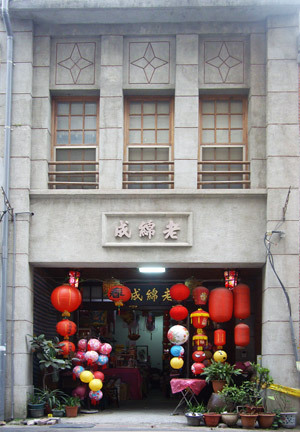 The area's distinctive European-style architecture traces its roots back to Dadaocheng's history as a wealthy river port where ships docked with the finest goods from Europe, America and Japan, and carried Taiwan's tea , sugar, rice and camphor to the world. You'll see and experience a lot, but the sights are close together so there's no need to walk far. We can adjust the itinerary depending on guests' requirements and the weather, to ensure an enjoyable and educational experience. This is not a 'one size fits all' tour, so let us know what you are interested in. Your guide, Jodie Tsao, grew up in the area, and her family's roots there go back generations. Discover: how modern Taipei has grown from its roots in this old commercial area, during the past one and half centuries. Understand how the businesses, people, temples, street restaurants are linked in Taiwanese society. See how people lived in the old community, and how that community is still strong today. Tea: Experience tea culture. Learn how to appeciate tea and serve tea in a one-hundred-year-old tea shop. 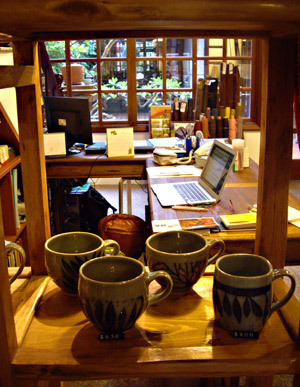 Tour the tea shop and enjoy a performance of traditional music. The tea shop we normally visit is family owned has been run by five generations of the same family. Food: Here are some of the local specialities you can try: Almond milk, fish ball soup, shrimp rolls on rice, herbal tea, malt biscuit, red bean cake (紅豆餅). 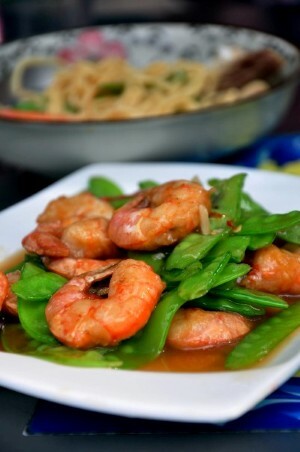 Includes lots of dishes suitable for vegetarians. 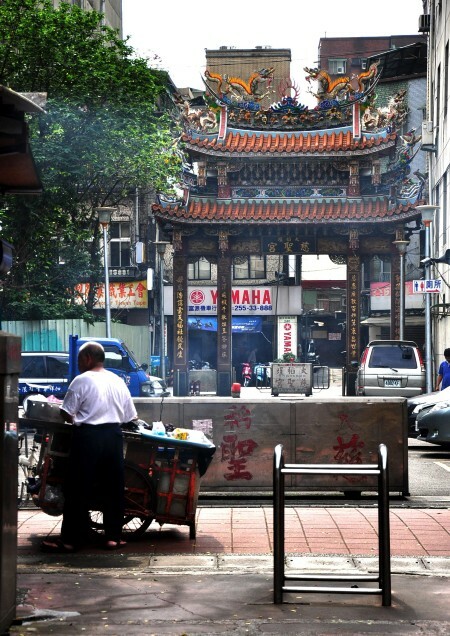 Visit: the 150-year-old City God Temple (城隍廟) and drink Blessed Tea (平安茶). Learn how street food is prepared, and what ingredients are used. Take a rest in an old southern Chinese tea house. 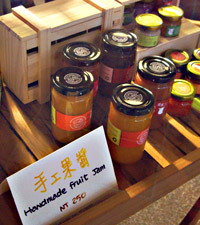 Taiwan is renowned worldwide for the quality of its tea. Shop: Understand how local people shop for fresh ingredients in the morning market (Taiping Market 太平市場), Taipei's oldest market. Try some local snacks and food in the market. 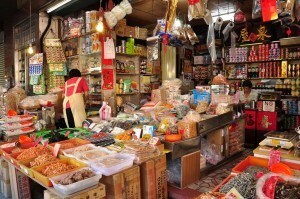 Visit herbal shops, and understand how Taiwanese people use medicinal herbs in cooking. Shop for souvenirs. This is one of the best areas to buy local souvenirs. Most of the shops are still making their own products. 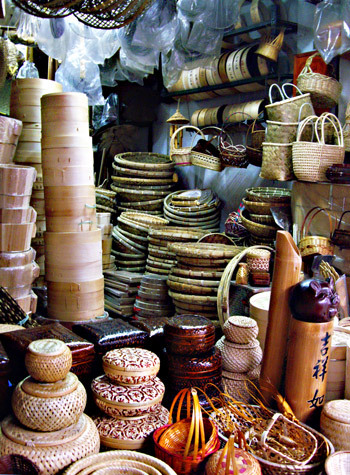 Shopping opportunities include fabrics, Chinese herbs and herbal remedies, cooking ingredients, wood and bamboo products, lanterns, tea shops, traditional ceramics, modern boutiques, arts and crafts, and so on. 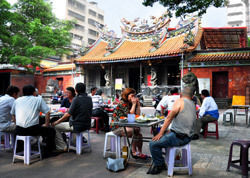 Fun: After the tour relax and enjoy a meal and drinks in a beer garden in the courtyard of the 150-year-old temple to the sea goddess, Mazu (depends on guest preference and weather). We invite you to explore Taiwan's history, culture and cuisine with us. Price: NT$6,000 for 2 people (private tour), add NT$3,000 for each additional guest in your group, up to 4. Food and drinks are included in this price. If you are paying in advance, we can accept payment by Credit Card or Paypal. For payments on the day, we may only be able to accept NT$ cash. Please contact us for details. Pronunciation: Dihua street (dee hwa jay), Dadaocheng (dar dow cherng). Starting location: Daqiaotou (大橋頭) Metro Station, Exit 1 -- or Shuanglian (雙連) Metro Station, Exit 2. Dadaocheng is located by the Danshui (Tamsui) river in the North-west part of central Taipei. Date: We can provide this tour on almost any day. Please contact us to discuss which day is most convenient for you.